There have been several versions of the Mutation X by Indulgence. Five to be exact and many seem to think that this one is the best one so far. Why? What is different about this version than the other four? Well, this version has some new options not offered in the previous versions. I have spent a few days with this Mutation X V5 and I have to say that it has really surprised me. I took one look at it out of the box and wasn’t all that sure about whether or not I would like it, let alone use it. It seemed really huge sitting on top of my VooPoo Resin. It is 34mm tall so it sits up pretty high and dwarfs most smaller mods. I eventually ended up using it on my Reuleaux 200W because it is a good size mod and it doesn’t look too bad on there. It works a little better for the size. The build quality is solid 304 stainless steel construction. All the pieces are smooth and have no blemishes at all. The “Mutation X” logo is etched on the front of the barrel section and it looks good. The airflow control on this one is very similar (to me) to the Wotofo Lush. You have 9 air holes on each side and the top cap has a cut-out or jigsaw design so that when you put it in place and turn, you can open just three holes on the bottom (horizontal) and if you keep turning you close off the bottom and open three on the side going up (vertical). I guess you could call it “multi-directional” airflow. There is also a little slot at the top which pulls air down into the build deck to create more vapor by going underneath the coils. I don’t know if that really works that way but I think that was the intention. The build deck is where this RDA differs from the others. When you remove the top cap and barrel, you will see a postless design deck. This is what got my attention, as I had never seen a postless build deck before. I had heard about them but never thought about trying to build on one. Turns out it wasn’t as hard as I had imagined. And you also have the option of adding the velocity-style posts to the deck if you want to use it that way. Although it doesn’t look like it, you can actually fit some pretty big coils in there. The well in this one is very shallow. I am used to deeper wells so I don’t have to drip as often. You just need the wicks to touch the deck because there really isn’t much to tuck. I did find that I was dripping more often to keep my cotton wet than with an RDA with a deeper well. I didn’t get any dry hits so it’s not really a con. It is very durable and sturdy. The barrel slides onto the deck very smoothly. There are no threads on this piece and the O-rings around the base keep it snug without scraping. There is also an O-ring built into the top cap for the drip tip. Keeps it snug but it is easy to remove and replace for dripping. 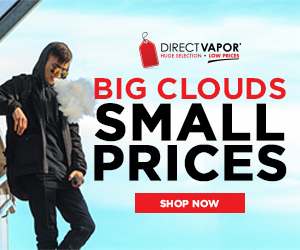 I would say that this is easy to use for vapers in the “intermediate to advanced” category. The multi-purpose build deck may be a little intimidating to new builders and I wouldn’t recommend it in that case. But for those experienced builders, you’ll love this design. Vaping on this RDA is really nice. I got good flavor and tons of vapor from just a single coil. I haven’t tried out the posts for dual coil yet because I have other similar RDAs with that post design and I was curious to try the one without posts after I got used to the idea. There really isn’t any leaking with this RDA because the airflow holes are so high up. As long as you don’t saturate your wicks too much you shouldn’t have any problems with leaking. Clouds upon clouds for days. It is really easy to fog up a room with this, even in single coil mode. You would probably get even more with a dual coil build and the airflow wide open. I like to close mine down to just a few holes because the whole 9 holes are too much air for me. The flavor produced by the coils is good. You can taste the flavor of the juice and it is true to the profile. Mine is wicked with just regular Japanese cotton pads but you may get better flavor from other wicking materials or wicking techniques. When this RDA first came out it was priced at $60. Since it has been out for a while that cost has come down quite a bit. You can find the Mutation X V5 for around $25 – $30 through most online retailers. It is a good value for the money and a nice RDA to have in your collection. You can check out all the License to Vape tank reviews here. 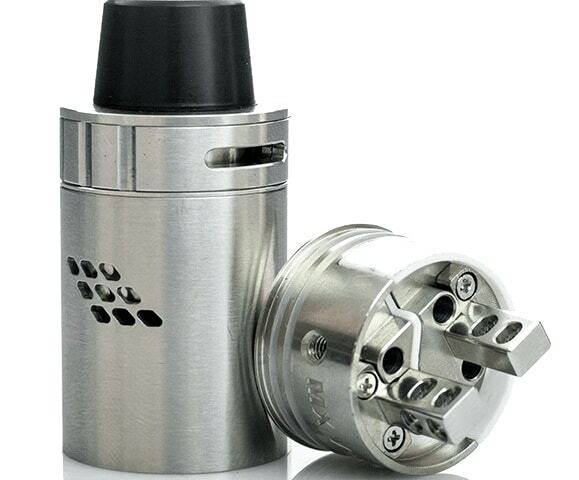 The price points for this RDA are good, it works great and produces huge plumes of vapor. The flavor wasn’t really “over the top” but the flavor is subjective anyway. If you want a nice RDA with 2 build options and don’t mind that it is on the big side, then I recommend you get one. This would be a great RDA for advanced vapers and season coil building pros.